Who are these networks ? This entry was posted in The hand pump maintenance approach on 9th March 2016 by mathieu. What is an Area Mechanic ? Area Mechanics or Hand Pump technicians are able to repair or diagnose hand pump within their catchment area. One hand pump technician has from 50 to 100 hand pumps to cover, mostly Afridev ones (some districts are also equipped with Malda pumps). They can intervene in case of breakdown but they are also proposing contracts for servicing to help the community for preventive maintenance (3 to 4 visits a year). They are officially recognized by the government and the Ministry of Agriculture, Irrigation and Water Development. 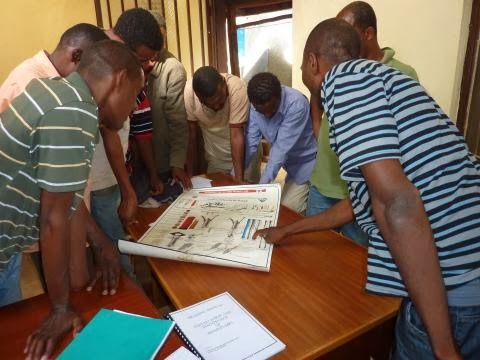 Area Mechanics are identified and then trained by Inter Aide or BASEDA / TIMMS by looking for skilled persons among the communities and according also to the recommendations of the Water department and District Council. This is also taking into account the needs in the area targeted : number of pumps that one person can supervised, according to distances and accessibility, avoiding also competitions between AMs so that each how them can gain benefits from this activity. In 2016, there are 388 AMs in Malawi who have been trained by Inter Aide – BASEDA – TIMMS, see details on the map. 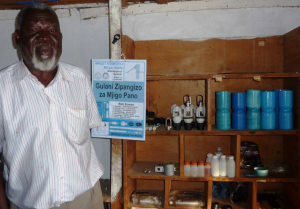 This entry was posted in The hand pump maintenance approach on 20th February 2016 by mathieu. 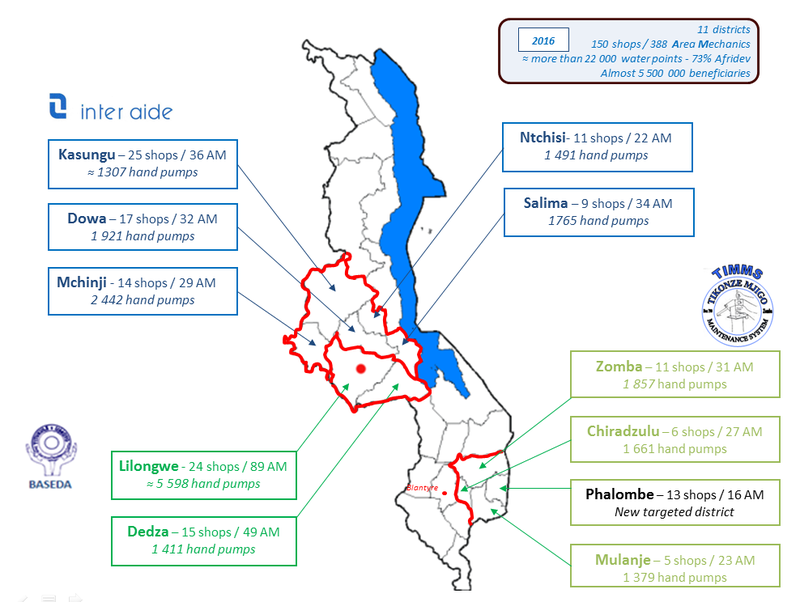 Afridev and Malda pumps both started ”life” in Malawi in the early 80’s. Focus on the development of Afridev shifted then to Kenya in 1983 ; and the Malda is the ”direct action” version of the Afridev pump developed in Malawi – MALawi Direct Action Pump : in 1994, UNICEF placed an initial order of 100 MALDA produced locally and installed in the project areas of Inter Aide and Concern Universal. Both of them are piston pumps. These pumps have been designed so that it could be maintained by users (VLOM pumps -Village Level Operation and Maintenance) and could be manufactured locally. the piston can be removed from the cylinder without dismantling the rising main. The foot valve is retractable with a fishing tool, meaning less risks of rods falling down and losing the borehole. It is designed to lift water from a depth no greater than 45 metres. The MALDA pump is a direct action pump, i.e. operating without the help of leverage, linkages and bearings, and depend on the strength of the operator pumping to lift the column of water. The maximum recommended lift is 15 m.
This entry was posted in The hand pump maintenance approach on 21st April 2015 by mathieu. In December 2012 an internal workshop and exchange was held by Inter Aide between Program managers from Ethiopia, Sierra Leone and Malawi. It was the opportunity to learn and exchange from each other on methods and tools related to ”maintenance programs” and especially on the maintenance of hand pumps. The 1st week was spent in Ethiopia with Yembeh, who came from Sierra Leone to explain to his Ethiopian colleagues the working principles of India Mark pumps. Indeed, the context where Inter Aide is working in Ethiopia allows the construction of gravity fed networks, whereas in Sierra Leone, the team is constructing and equipping hand dug wells. However, in the lowlands of Ethiopia, hand pumps are more common and the team wanted to get more experience on it in order to integrate such systems into a maintenance approach. In the meantime, Yembeh had the opportunity to learn more about gravity schemes thanks to Asrat, WASH coordinator in Ethiopia. Then the 2nd week Yembeh ; Akalu – WaSH program manager from Ethiopia ; Gedewon – WaSH Coordinator of our partner RCBDI, has been introduced to the networks of Area Mechanics and spare parts retailers in Malawi by BASEDA + TIMMS represented by its coordinator Teddy, and Laurent, Inter Aide’s Program manager. 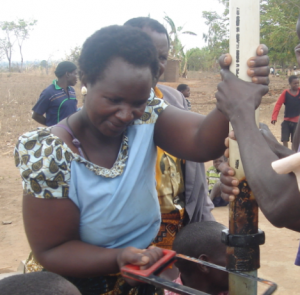 It was the opportunity for them to discover a large hand pump maintenance scale project covering a lot of communities. In the meantime, visiting the project in Phalombe, the Ethiopian team provided also some advises for rehabilitation of gravity schemes. This entry was posted in The hand pump maintenance approach on 20th December 2012 by mathieu.